Deacon John Bartos is a lifetime resident of Hubbard. He attended St. Patrick School and Hubbard High School. He is employed by the House Doctors Window and Door Co., Inc. for nearly thirty years. 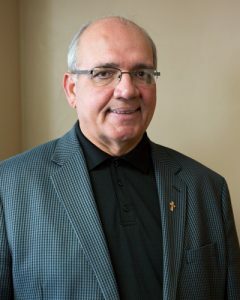 He has been married to his wife, Karen Bartos, for thirty-eight years, who serves as the parish C.R.E. They have two married sons, Johnny (Mary) and Michael (Julie). Deacon John and Karen have a beautiful grand-daughter, Ariana Marie. Deacon John was ordained September, 2014, at St. Columba Cathedral by Bishop George Murry, S.J. Deacon John serves St. Patrick Church in various capacities and looks forward to continuing to answer God’s call.